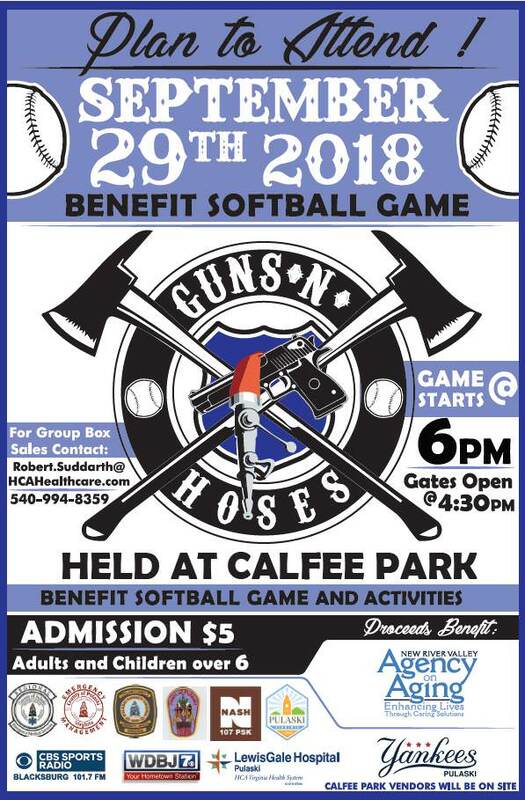 LewisGale Hospital Pulaski presents the 2018 Annual Guns N Hoses Benefit Softball Game on Saturday, September 29, 2018 at Calfee Park. Local law enforcement and firefighters battle it out in the 2018 Guns N Hoses Benefit Softball Game. Proceeds benefit the New River Valley Agency on Aging. The Pulaski Police Department will be selling shirts and raffle tickets at the gate and in advance. Calfee Park vendors will be available. Admission is $5.00 for adults and children over 6 years old. Gates open at 4:30 pm game starts at 6:00 pm. NOTE: This event was originally scheduled for September 15th, but was postponed due to the threat of Hurricane Florence. To view the event flyer, visit: https://i.imgur.com/mh6dym8.jpg. For more information, visit: http://www.pulaski.town/events/guns-hoses-benefit-softball-game/ or https://www.facebook.com/events/311812099382496/.